Footballer Ryan Giggs has launched legal action against the News of the World over claims his mobile phone was hacked, his lawyer has said. The Met Police are investigating claims the paper hacked into the messages of public figures between 2005 and 2006. The Wales and Manchester United star was recently at the centre of a row over the use of injunctions to stop claims of an affair becoming public. News International, which owns the paper, said it was aware of the claim. It comes as the company said former Sun and NotW editor Rebekah Brooks, who is now News International chief executive, had been shown documents by police which proved her voicemail had been illegally intercepted. The Met Police's Operation Weeting is investigating claims that staff at News International's News of the World newspaper had hacked into the phone messages of celebrities and other public figures from 2005 to 2006. BBC home affairs correspondent Tom Symonds said: "Ryan Giggs is a well-known figure and will have been of major interest to the tabloid newspapers. "That's probably what's happened and now he will go away and seek legal action." 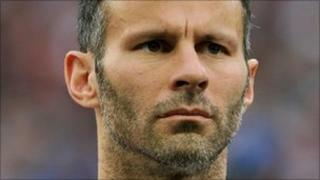 In April, Giggs's Man Utd team mate Wayne Rooney said he had been contacted by detectives involved in the investigation. In 2007, the first police investigation led to the convictions and imprisonment of then News of the World royal editor Clive Goodman and private investigator Glenn Mulcaire, who was employed by the paper. Most recently, actress Sienna Miller formally settled for £100,000 damages and costs after accepting an apology from the company for hacking into several of her phones. Last month, Giggs was named in parliament as a footballer who had tried to use an injunction to hide an alleged affair with reality TV star Imogen Thomas. Using parliamentary privilege to break the court order, Lib Dem MP John Hemming said it would not be practical to imprison the 75,000 Twitter users who had named the player. The player obtained the order against the ex-Big Brother contestant, who is a former Miss Wales, and the Sun. His lawyers also obtained a High Court order asking Twitter to reveal details of users who had revealed his identity after thousands named him.